I got three hockey history titles from little known St. Johann Press today. St. Johann Press is a small publisher out of New Jersey that, amongst other things, specializes in sports history books, including the three hockey titles provided to me by president Dave Biesel. All three books are written by members of the Society for International Hockey Research. Glen Goodhand is out first with Hockey's Historic Highlights. Published back in May, his book is a collection of fascinating, unbelievable and downright strange stories from the hockey history. He specializes in the little-known and unknown stories while retelling stories of hockey heroes and characters. "Hockey is his passion. His diligence and his curiosity has led to this chronicle - a gift to the game and those who love it." 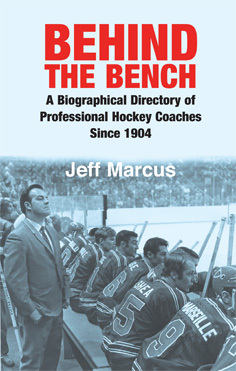 Next out of the box is Jeff Marcus' book Behind the Bench: A Biographical Directory of Professional Hockey Coaches Since 1904, also available from Amazon.com. Marcus documents the professional coaches dating all the way back to 1904, the date of the first openly professional hockey league, the International Hockey League. He goes on to cover all the coaches in all of those early leagues including the Ontario Professional Hockey League, The Eastern Canada Hockey Association, the Pacific Coast Hockey Association, the Western Canada Hockey League and the National Hockey Association. Of course, that NHA would later be reformed into the National Hockey League. Marcus moves away from all the obscure pro leagues that littered the 20th century but does focus on all WHA and NHL coaches, right up until the current day. (Oddly, the American Hockey League was not covered). Marucs does a good job as biographer, expanding far beyond the on-ice record to include as much personal and family information as possible in the profiles, as well as talk of each coach's own playing days. Last but certainly not least is Roger Godin's Red, White and Blue on Ice, also available at Amazon.com. Minnesota is considering to the home of hockey in America, and no one knows this better than Godin. Godin is Minnesota's leading hockey historian, so much so that the Minnesota Wild hired him as the team's official curator. 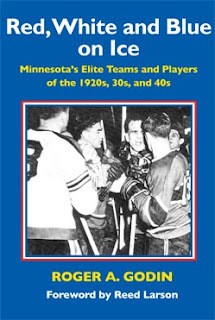 In this book he offers a look at Minnesota's elite hockey teams and players of the 1920s, 1930s and 1940s. 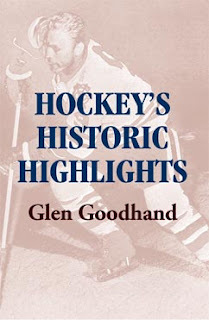 Godin looks at five championship teams and one runner up in the days of the AHA and CHL days prior to the 1950. In addition to focusing on these teams, Godin pays special attention to six hockey heroes on those teams, telling the story of Doc Romnes, Mike Karakas, Cully Dahlstrom, Hub Nelson, Frank Brimsek and John Mariucci. The 346 page book, illustrated throughout, fills a void in American sporting history.